THIS PROPERTY IS 100PCT NON-SMOKING The Hampton Inn - Suites Spartanburg I-26 *Westgate Mall hotel in Spartanburg South Carolina is located in the heart of the business shopping and entertainment district. We are a perfect hotel for the business or leisure traveler. The hotel is next door to Summit Pointe Conference - Events Center featuring over 19 000 square feet of dedicated banquet meeting and event space. 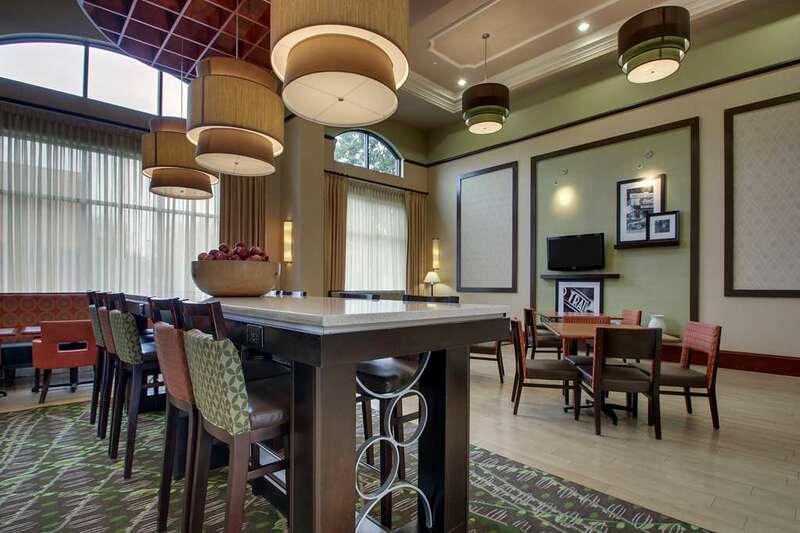 The Hampton Inn - Suites hotel in Spartanburg is a 126 room hotel with 36 studio suites. The hotel offers complimentary wireless high-speed internet access in each guest room lobby and breakfast area. The hotel serves a complimentary hot breakfast each day and offers 24-hour business and fitness centers as well as an indoor heated swimming pool. A complimentary shuttle service to the airport as well as over 150 restaurant shopping and business locations within a 3-mile radius is available. The hotel is within walking distance of Westgate Crossing Shopping Center Spartan 16 Theaters and Westgate Mall the largest mall in Upstate South Carolina with four major department stores boutiques and kiosks surrounding an extensive food court. The Hampton Inn - Suites Spartanburg is located just off Interstate 26 and one exit from Interstate 85 with easy access and availability to the majority of the Spartanburg*s businesses that include Tietex Tindall Michelin Coca Cola BMW QS1 Data Systems CH2MHill Milliken Exopack Kohler and Zimmer-USA. Spartanburg has plenty for our leisure guests to do as well be it visiting the Chapman Cultural Center Hatcher Gardens Hollywild Animal Park the Price House Walnut Grove Plantation one of our seven colleges and universities or the Beacon Drive-In the oldest operational drive in in the United States also featured on the Food Network. A perfect hotel in a perfect location backed by the Hampton 100 Satisfaction Guarantee. We love having you here at the Hampton Inn - Suites Spartanburg I-26 *Westgate Mall.